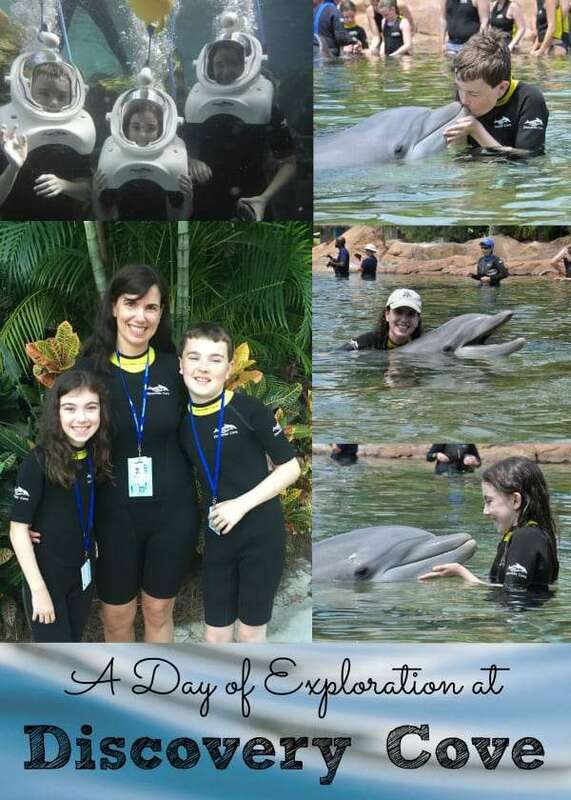 A special thanks to the folks at Discovery Cove for hosting our amazing day! While our visit was complimentary, all opinions expressed are 100% our own. 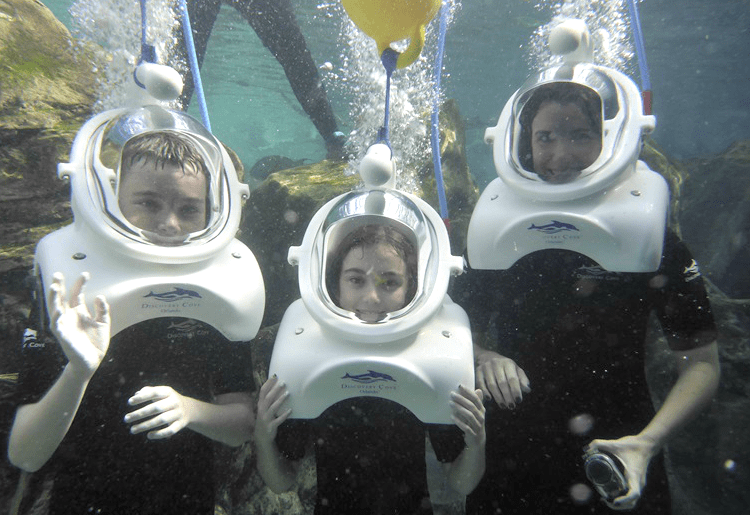 Discovery Cove is truly like no other place we have ever visited. 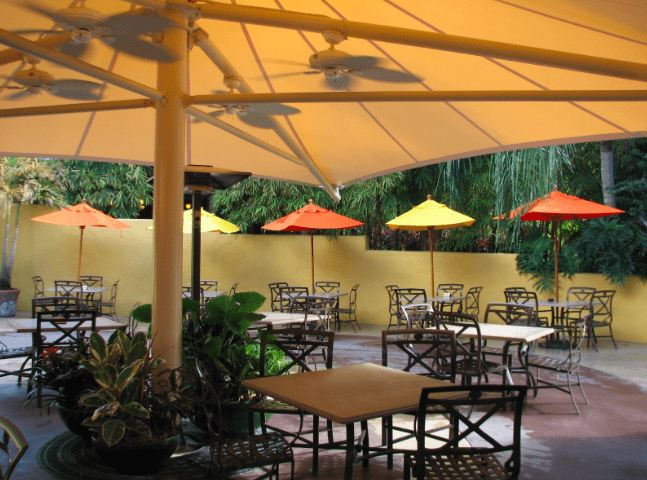 It’s like stepping into a tropical oasis in the middle of land-locked Orlando. This is an experience we will cherish for years, and fulfills a life-long dream of mine to swim with dolphins. 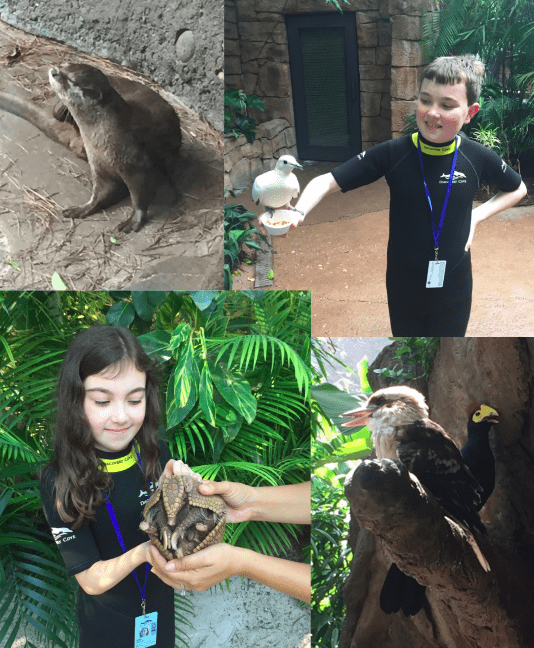 Here is a detailed report of our day at Discovery Cove . If you don’t have time to read everything, check out what’s in bold throughout this post for our favorite highlights, tips and recommendations. 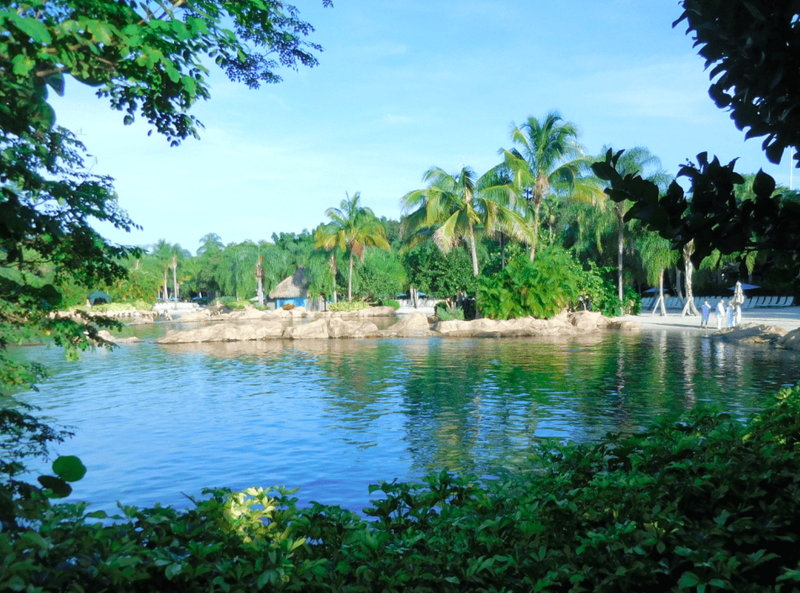 Definitely plan to spend the entire day at Discovery Cove. The park opens at 8am so official check in starts at 7:30. We arrived right about 8:00. The check in lobby is spacious and inviting with a pacific island theme. The staff is very courteous and work the lines to keep any crowds from building up. It was only 10 minutes or so before we were checked in for our the day. The general scenery throughout the park is lush and lovely. I felt transported to a beach resort in the tropics rather than the land-locked region of Orlando. 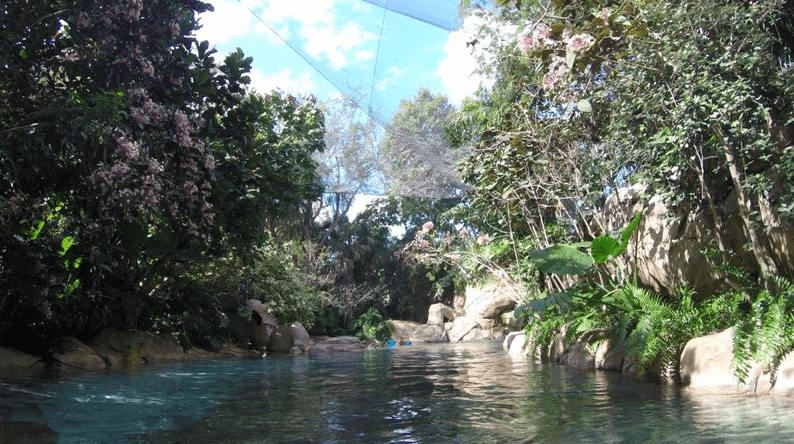 There are 6 main areas, the Grand Reef, Dolphin Cover, Fresh Water Oasis, Wind Away River and Explorer’s Aviary. As you can see on the map above, the Grand Reef and Dolphin Lagoon take up about 2/3 of the park. After all, these are the star attractions. Lounge chairs overlooking fresh water oasis. 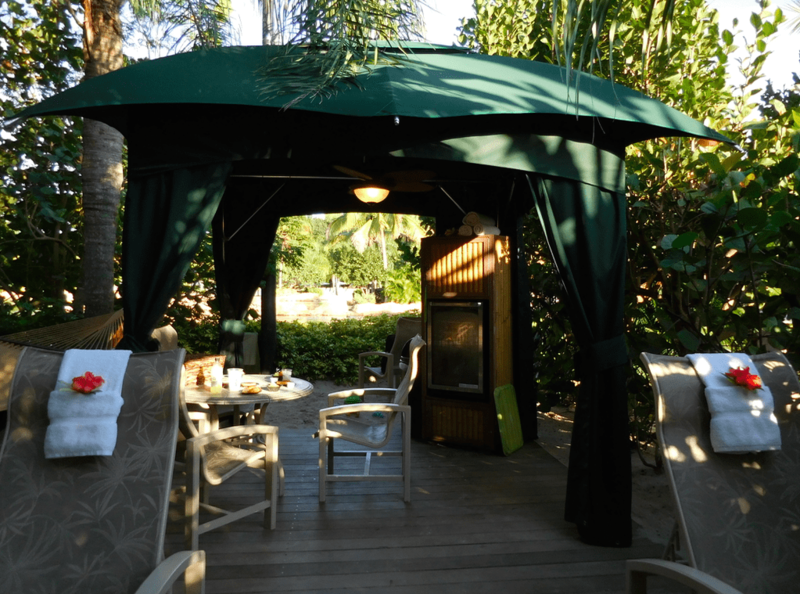 Our wonderful cabana in the shade. View from our cabana overlooking dolphin lagoon. There are only a specific number of people allowed in one day, so it doesn’t feel like there is an overwhelming crowd anywhere in the park. If you can afford the extra fee, I wholeheartedly recommend getting a private cabana. Ours overlooked the Dolphin Lagoon, which was AMAZING!! It was great to have a private place to eat and relax. Cabanas have a fully stocked drink refrigerator, personal locker, basket of snacks, lounge chairs, dining table and hammock. It’s certainly the way to go if you want to feel a bit extra pampered. Even if you don’t spring for a cabana, there is a huge number of lounge chairs throughout the park. It never seemed like people had to hunt to find a seat. 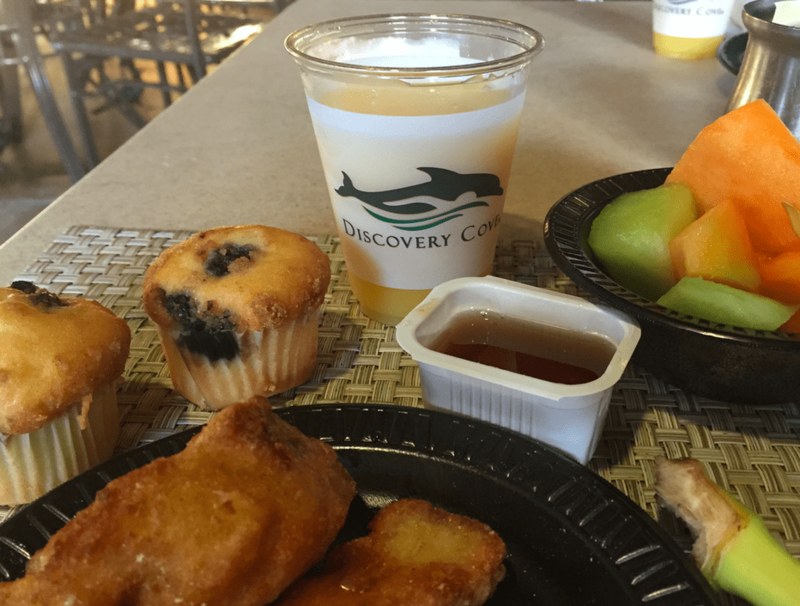 Breakfast of french toast sticks, muffins and fresh fruit. All food and drinks are included in your park entrance fee. 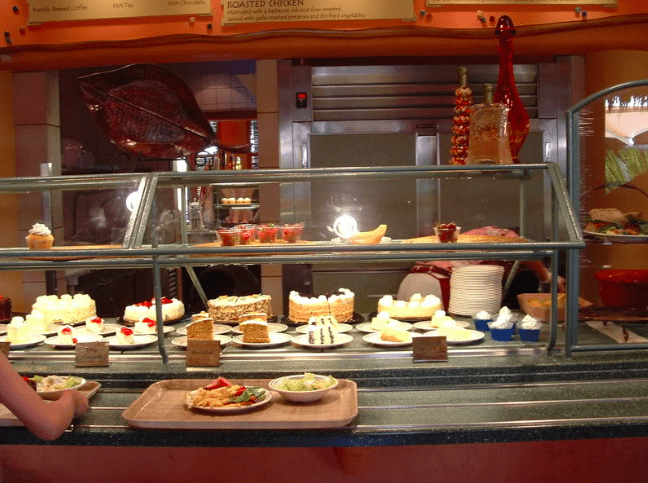 In the main dining hall, everyone walks through a cafeteria-style buffet. The food is nothing to brag about, but there was a wide selection of choices, which worked well for my picky kids. The line for breakfast was not crowded, but lunch was quite busy so plan accordingly. We had to wait about 20 minutes to get our food. In addition to the main dining hall, there are a number of snack shacks offering snacks like ice cream, mini hot pretzels and both alcoholic and non alcoholic drinks. Wet suits, swim vests, life preservers and snorkel equipment is all included in your park fee. Animal-friendly sunscreen is also provided. It’s a good idea to get suited up right after breakfast so you are good to go for the rest of the day. There are two water temperatures in the park. The salt water areas for the Grand Reef and Dolphin Lagoon are kept quite cool (77 for Grand Reef and 72 for Dolphin Lagoon). I highly recommend a full wet suit for these areas even on a warm day. You can always switch into a swim vest later. The fresh water areas are between 84-88 degrees so they area a great place to warm up. The Grand Reef is home to a plethora of tropical fish, sting rays (stingers removed) and manta rays. There are shallow areas for folks who just want to walk and maybe stick their faces in and deeper areas for snorkeling. I recommend visiting this area of the park first. It is the one area which can feel quite crowded later in the day. We were especially in awe of the rays. I could watch them all day. I kept following them around with my camera. My kids loved all the colors of the tropical fish. If your kids are not super strong swimmers, I advise using a life jacket. The wet suits will help you float a bit, but snorkeling in the deeper water can get tiring pretty quickly. My daughter was happier once she put on a life jacket so she did not have to work so hard to enjoy herself. 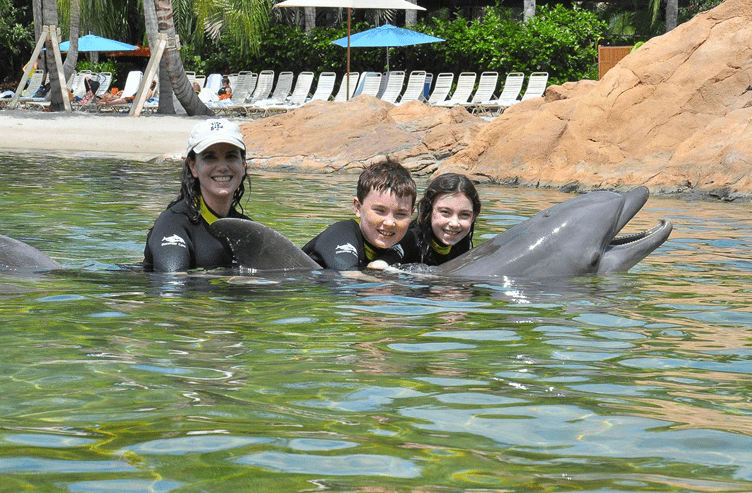 The dolphin swim is best known feature at Discovery Cove. 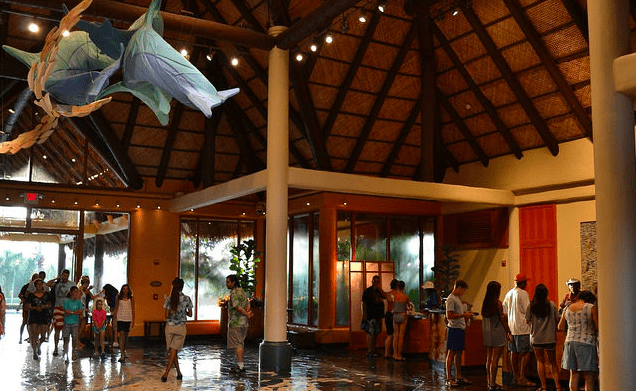 Park visitors are grouped for a total of 9-12 participants in each dolphin encounter. We had a fun group with folks from Scotland and Detroit. Each group watches a short training video and then follows their trainer down to the dolphin lagoon. Can we take her home? Other groups are interacting with dolphins in different areas of the lagoon so it’s fun to see what their dolphins are up to as well. Everyone has a turn to have a dolphin tow them through the water. You can be towed through the shallow water or go into the deeper area and be towed to shore. We opted for the latter. Wow, we can breath underwater! The Sea Venture experience is an added cost per person. 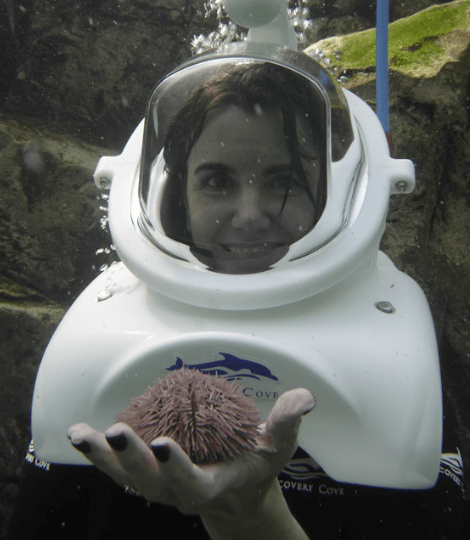 It’s a SCUBA-like experience in which participants wear under sea helmets. We were all a bit nervous, but decided to give it a try. I tent to have claustrophobia in certain situations, but I was still able to go for it. After a short safety video we were ready to go! The most disconcerting part is when they first set the helmet on your shoulders. Once you start down the ladder, it is a piece of cake. Meeting a new under-sea friend. We all made it down to the bottom successfully, but my daughter had to go up early because she was freezing. We did not realize that snorkeling in the Grand Reef for over an hour BEFORE our Sea Venture was NOT a good idea. I was able to stay down, but shivered the entire time. The tour guides stay in close communication with everyone to keep us safe and feeling confident. Getting a closer look at the sharks. Overall, the Sea Venture was a really interesting experience. It was a way to get up close and personal with a number of the under sea creatures and tropical fish. 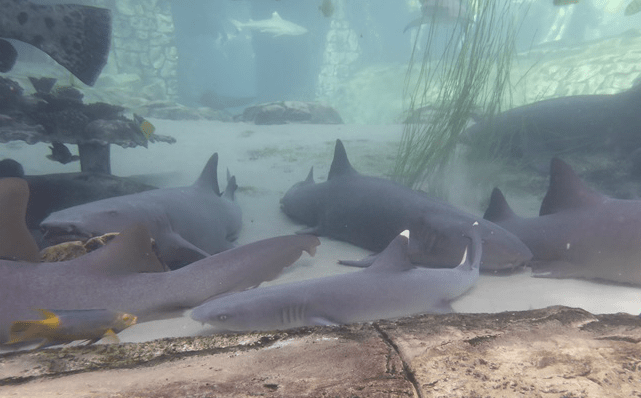 There is a shark tank in this area where the Sea Venture folks definitely get the best view. It felt so good to get in the warm fresh water area after our time in the cold salt water areas. In this area, you can view marmosets, otters and tropical birds (the Wind Away River crosses through the Aviary). Serenity Bay, part of the Fresh Water Oasis area, has a zero depth entry from the beach, which is great for toddlers, and a handicap accessible ramp. 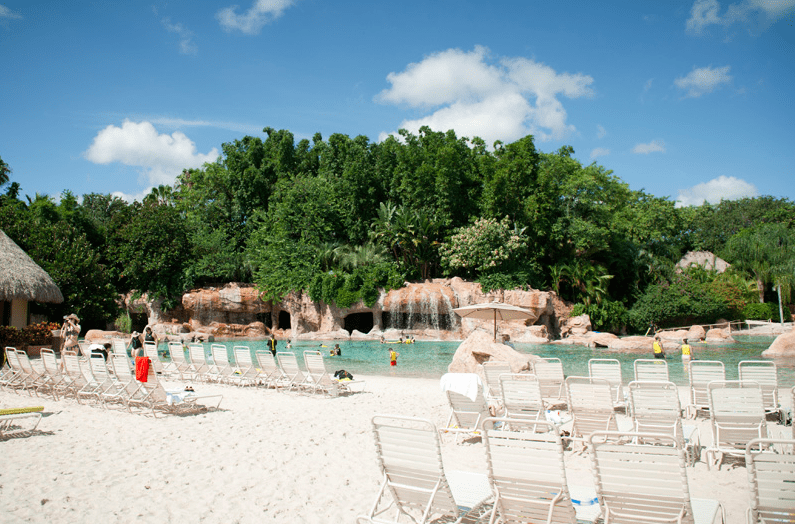 It’s a large swimming area built to look like a lagoon with waterfalls and rock formations. Under the net of the Explorer’s Aviary. The Wind Away River is essentially a “lazy river” where you float along a trail and observe the surrounding nature. My kids loved the beginning which is a man-made cave. I recommend grabbing a swim noodle or life jacket for this part so you can really relax. When you float in and out of the Explorer’s Aviary, there is a waterfall that you need to pass under. This keeps the birds from escaping this area of the park. Young children may find this scary. You can depart and re-enter the river on side stairways in a few areas if needed. This is the perfect area to interact with birds, peek at the otters and maybe get a close-up encounters with other creatures. We were treated to a visit from one of the resident armadillos. Isn’t she cute? My son is a bird lover so he could have spent hours in the Explorer’s Aviary. There are no outside cameras allowed during the dolphin swim. We were treated to the video/photo package for our dolphin swim. The photos were amazing!!. I was not really impressed with the quality of the video. The audio was very poor and the picture quality was not very good. If adding the video costs more, I recommend skipping it. We also opted to use one of the park’s digital cameras for our Sea Venture experience. These pictures were also well worth the memories we captured. For all other areas of the park, having a water proof camera comes in handy. 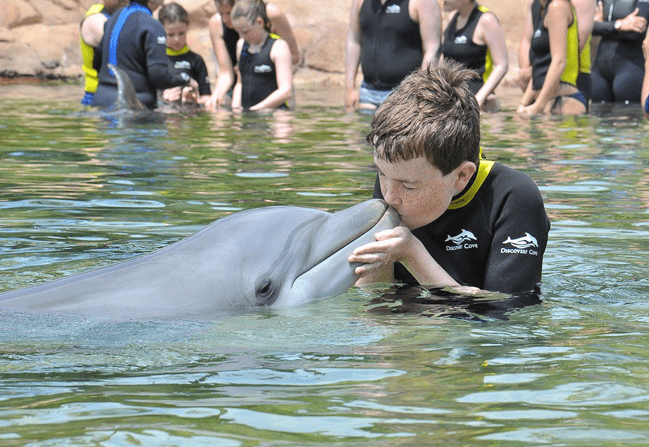 Have you ever been to Discovery Cove? If not, what do you want to see most? I’ve never heard of anything like this before- who knew this was in the middle of Florida? I’m officially adding this to my list of places I must visit; who doesn’t want to swim with the dolphins?! Wow – I’ve never heard of this place but it sounds awesome. I’ll have to look it up next time I’m in town! Playing with dolphins sounds fun too. 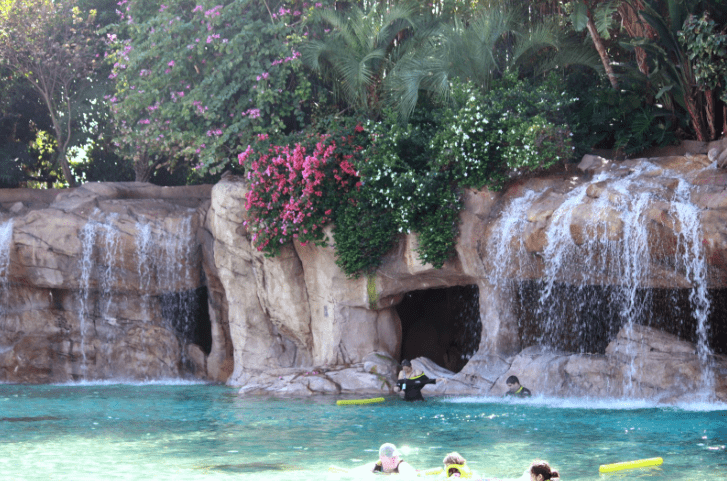 Places like discovery cove can give each of us a glimpse into nature that we never would have otherwise. Appreciate the “when” to wear wetsuit tips…a true fashionista. Ok wow how have I never heard of this place before? My kids would go nuts here and it would be a perfect vacation that appeals to everyone in my family. I see a visit in my future we can hit the great-grandparents in Panama City then rive down here for a few days! Discovery Cove has been on my bucket list for years. I got to “pet” a dolphin years ago at Sea World in San Diego and just that was amazing. I can’t imagine what it’s like to actually get in the water with them. 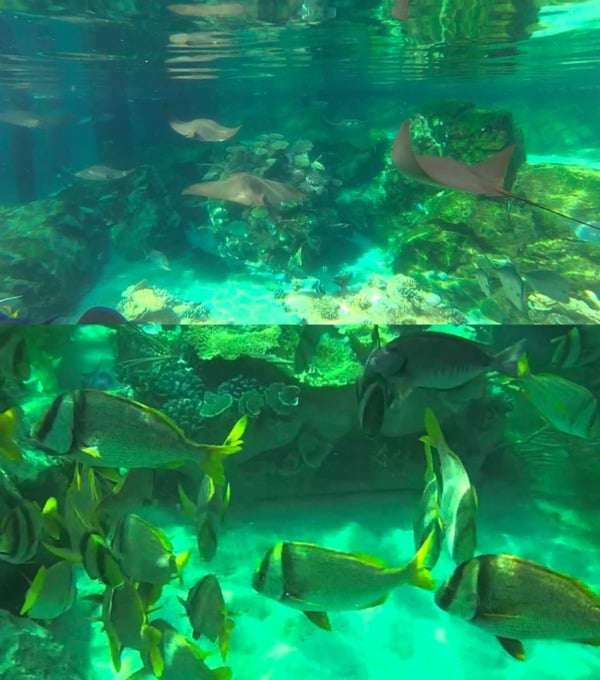 I love Discovery Cove and have been several times. I took my nieces on the dolphin swim one year, they were 8 and 12 at the time. 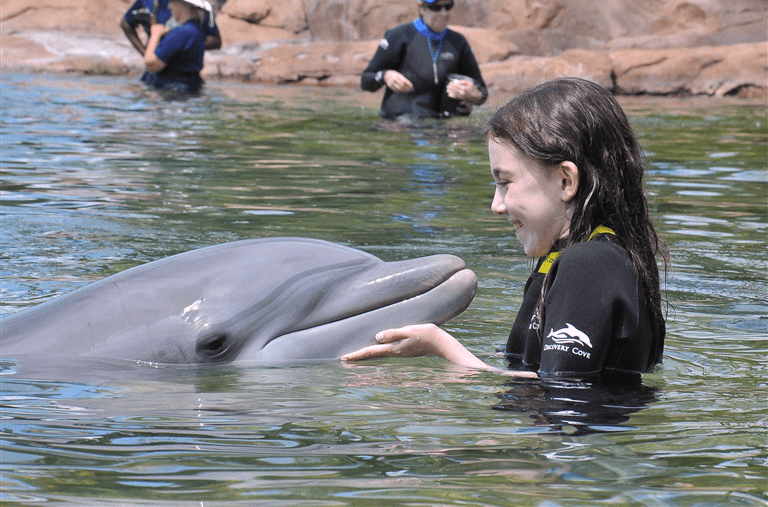 The 8 year old was a little too scared to do the swim, even across the shallow water, so the trainer let her feed the dolphin all the treats to kind of make up for it. They are now 14 and 18 and still talk about that trip! 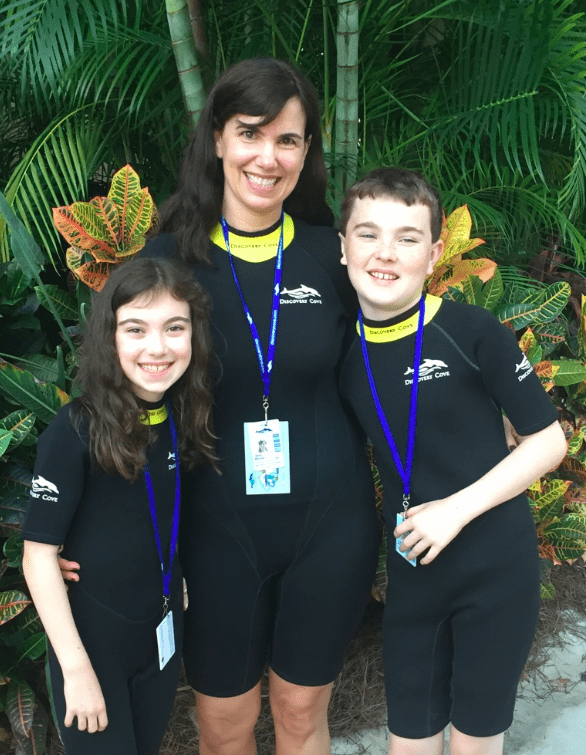 I have taken other family members as well and now it has become somewhat of a tradition to go (without the dolphin swim – that can get expensive to do every time). If you are a Florida resident, be on the lookout for discount rates, especially through the winter. 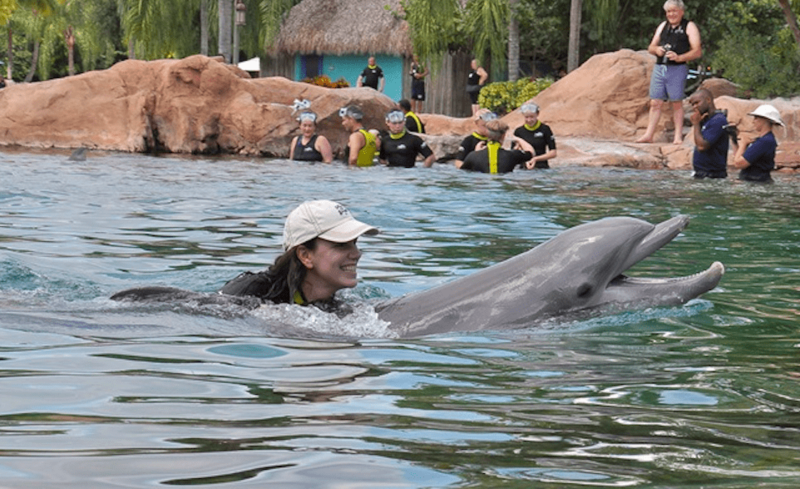 If you have a Sea World annual pass, you can get even better discounts (which is how I have been able to go so often – sometimes as cheap as $59 for just the day pass, no dolphin swim). I just love their sitting arrangement and food style.